So, that’s the story of the game –how does it work? 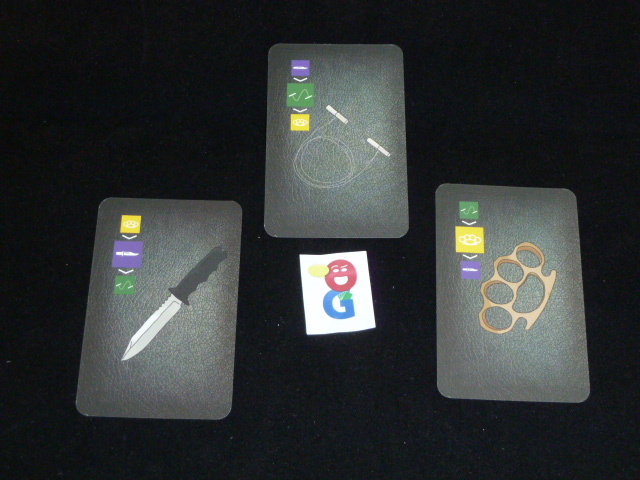 Well, each player starts with a small deck of interaction cards – a few disposition cards:3 Attack cards (think rock, paper, scissors), a Neutral Card and a Friendly card. The player also gets a Loyalty card which tells them which faction they belong to. 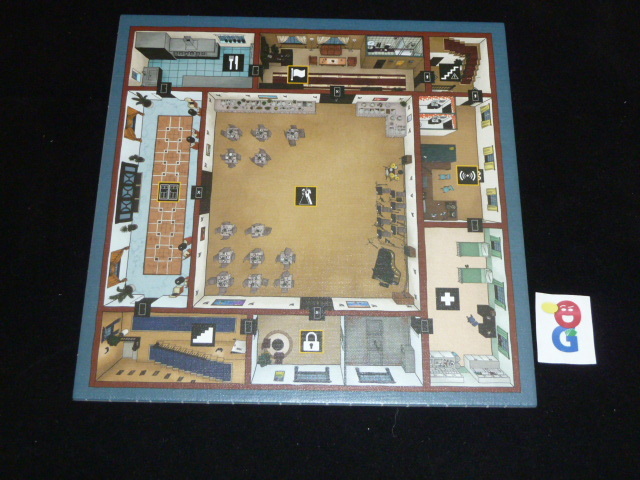 There is a briefcase tile which hides a card – that might hold either side’s Intel, a bomb or some random equipment. Players all start in the Entrance room, and then they take turns clockwise around the board. On a turn, you can either use an Action in their current room OR they could move and then possibly take an Action or have an Interaction depending on what they find in the room they stop movement in. When you move, you can usually move until you decide to stop. If you pass through a room with someone, you are obligated to have an Interaction, though this doesn’t necessarily end your movement – your movement ends only if your Interaction ends in an Attack. In an Interaction, two players meet in a room. Each of them secretly and simultaneously chooses one of their disposition cards: Friendly, Neutral or an Attack card. They exchange them with each other and then you pretty much have to look at a chart in the rules to see what happens. If either player plays an Attack, then an attack happens – you compare the RPS icons on the cards and see who wins. 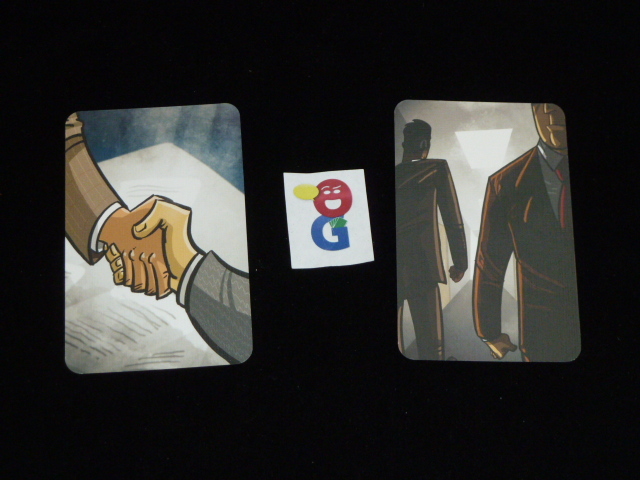 The winner can choose to injure the other person (limiting their movement to 2 rooms at a time), steal a card from their hand, or Interrogate the other person. 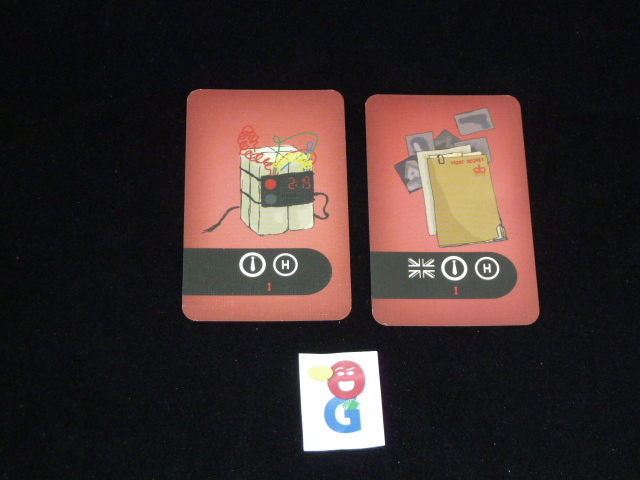 The defeated player must take his Attack card and combine it with a Neutral card and his Loyalty card. The winner gets to shuffle them and look at one randomly, then he hands the cards back – so that the loser doesn’t know what card the winner got to see. Otherwise, any Friendly player can choose to give an item or heal the other guy (as long as that guy didn’t play an Attack). Two neutral cards end up doing nothing. Finally, someone must leave the room as there cannot be multiple players in the same room at the end of any turn. There are a couple of cool rooms in the embassy that give you some special powers while you’re occupying them. When you’re in the X-ray room, you get to see the item cards of any player who passes through a door marked with an X-ray detector anywhere in the Embassy. The Security HQ room allows you to look at any of the cards played in an interaction, including any cards seen in an Interrogation. Finally there is the Computer room which allows you to hack a player who uses any of the 6 “computer operated” rooms – a hack gives you a 50% chance of learning their Loyalty. So, again, you move around the embassy, looking for your intel. When you think you have it, you go to the Radio room to call a helicopter (you can call a helicopter of either faction), and then race to the roof to get into it and fly away to victory OR blow it up with bomb you’ve been hiding in your pocket. If you’ve managed to figure out who your partner is, you might even be able to be more efficient at this by having someone in the basement call the helicopter while the other does whatever he’s going to do on the roof. Oh, and along the way, while you’re playing – the game adds a second level of guessing/misdirection in that it allows/encourages you to lie about anything during an Interaction. You’re never allowed to prove/disprove anything by showing a card – those have to be chosen in the random Interrogation procedure – but you might be able to talk someone in to believeing that you are on a particular side. The game includes a number of different scenarios: a beginner mission, the standard mission (that I have described above), an asymmetrical 5p mission, an advanced 3p mission, and a semi-cooperative 2p mission where you play against programmed guards. I’ll start by saying that this really isn’t my sort of game. I’m not a huge fan of hidden identity games – and this doesn’t do much to set itself apart from that genre. I have only played the standard mission thus far – and for me, it’s filled with a bunch of wandering around and then hoping that luck goes my way in the RPS interactions and then getting lucky with card draws in interrogations, etc. The rules were, for me, not well organized. 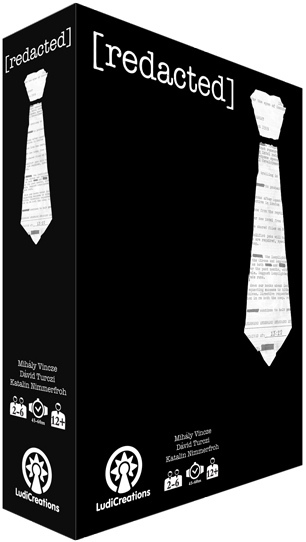 The scenarios which outline the overall setup and goal of the game are found near the back of the rules – after I’d read about 6 pages of confusing little rules/minutiae that made no sense as I didn’t have any framework to wrap the rules around. So, after spending 30 minutes going thru it to start, I finally figured out what I was supposed to do, and then I had to go read the rules again from the top. Thematically, the story doesn’t really make sense. Why do you go into a mission without knowing your partner? If you’re on opposite sides, why don’t the helicopter pilots of the opposing sides blow each other up in the air around the embassy? What sort of embassy can handle the detonation of a helicopter on its roof and then continue to hold whatever reception you’re at, and what sort of helipad is resistant to damage from a previous helicopter explosion? Do you have the plans? Or maybe a bomb to blow up a helicopter? Frank B: I’ve played twice, and I’m a bit too confused by the game to rate it as well. I can say for certain that the Tutorial Mission is total rubbish which should be avoided at all costs. It rips out most of the rooms special functions which means that the entire game is running around having interactions. There are two other methods to learn intel, and the full game is rather better. 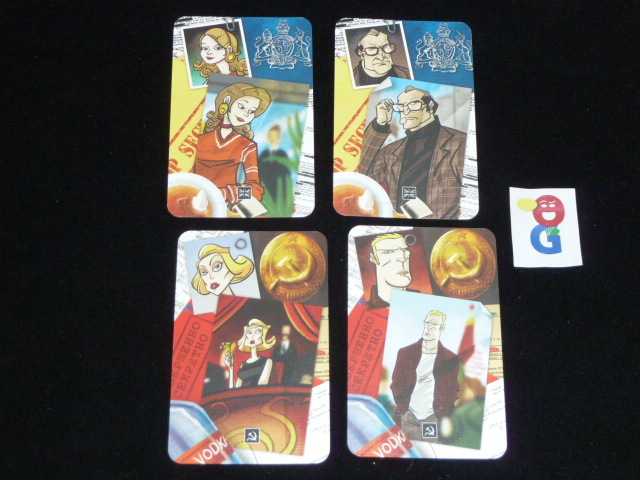 The other problem is that the game is…convoluted…enough that it nearly impossible to actually play correctly. Much of the game happens in the interactions, and there are enough small rules that can be screwed up there (example: showing your alliance). And many of choices have to be done secretly. The last thing I can say about the game is that it was clearly inspired by the Alex Randolph classic Inkognito. The same mystery and intrigue feel of that game are present, but with zero deduction and a focus on items and hitting people. This is a game that is hurt by bad rules. Ive read the rules, I even made a rule summary but I still dont think I know what you are actually doing during the game. Im not dure if Im ever confident enough to try it out with some very open minded gamers. i played redacted for the first time with my family for new years eve. we watched a gameplay video (by rahdo) which really helped understand kind of the flow of the game. i highly recommend playing the training scenario: “the two man rule” and have everybody practice interacting, using the special rooms and trying to accomplish the mission (uploading a disc). then, when you add the additional difficulties of the quintessential phase, everyone has a base understanding to go off of. i will say that it’s a little crazy flipping between the three booklets, and some things are not clear immediately. we played 3 rounds of “mission diplomatique.” everyone made mistakes, but we thought it was super fun. my main criticisms are the graphic design and better organization of the rules.